In this week’s Martin & Sylvia: Saturdays! story “Mother’s Helper,” brother and sister help Momma keep a little friend entertained. We all need a bit of inspiration from time-to-time, whether we’re looking for something to fill a few moments of down-time or an activity to do with a visiting friend. While grown-ups might turn to blogs or pinterest, little ones need something that’s a little less techy but still filled with just the right amount of inspiration. What we’ve cooked up is a simple three jar system, filled with activities for doing solo, enjoying with a friend, or tackling with a grown-up. Simple words are great for independent readers while pictures give a bit of a hint to the pre-reading crowd. While Martin & Sylvia don’t have a setup like this in this week’s Martin & Sylvia: Saturdays! story, it certainly would help them come up with a variety of activities to do with little Laura! Start by having a conversation with your little one. Talk about activities you might like to include in your activity organizer – what have they done in the past that they’ve enjoyed? Talk about each activity and whether it is something that they’re able to do by themselves, with a friend, or with a grown-up. Make a list. Divide a paper into three columns. Choose the activities you’ll include for each grouping – by myself, with a friend and with a grown-up. All the included ideas should be ones where supplies are usually around the house and available. Also, they should be activities you won’t mind your little one choosing after being inspired! Paint the top of your wooden sticks three different colors, one for each grouping. Write the activities for each category onto the sticks. Include a small picture for pre-readers. 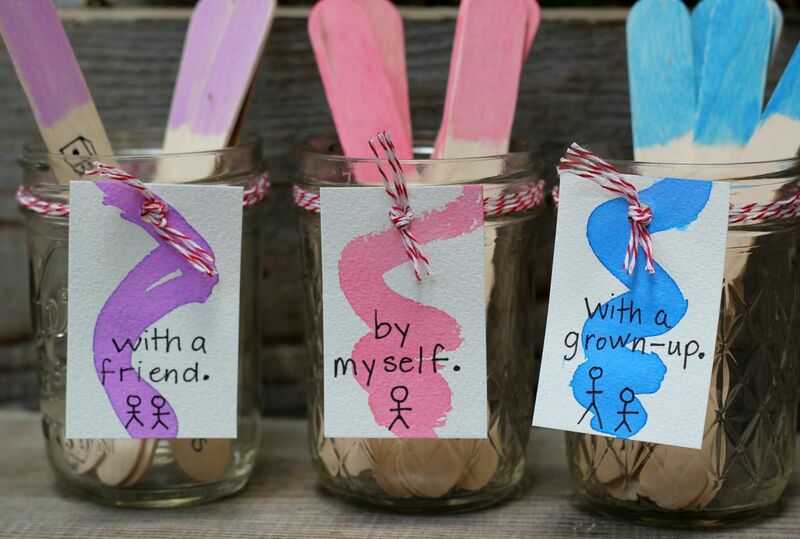 Sort the sticks by color into three different jars. Cut the card stock into three small pieces, about 2 inches by 3 inches. Punch a hole in the top and label each with the category – by myself, with a friend, and with a grown-up. Attach the card stock to the corresponding jar. Do you have any activities that would work in more than one jar? Make multiples and put them there! Have you ever played Scudge Pundleman? Would you like to try? Put it in your “with friends” jar and give it a try next time someone visits! Are any of the activities in your “by myself” things that you used to need help doing? Do you think any of the activities in your “with a grown-up” jar are things you might be able to do alone in the future?